The Importance of Digital Workspaces for Productivity, Profit and Security. Home / podcast / The Importance of Digital Workspaces for Productivity, Profit and Security. I recently had a chance to interact with Sanjay Deshmukh, VP, End User Computing, VMware Asia Pacific & Japan to discuss on what Digital Workspaces are and why they are important for businesses. We met on the sidelines of VMWare CIO Forum in Mumbai and here is the transcript of our conversation. Kiruba Shankar: Sanjay, thank you so much for coming on the Movers & Shakers Podcast. Kiruba: What are Digital Workspaces and how would you explain to someone hearing this term for the first time? Sanjay: Before I explain what is a digital workspace, I think it is important we talk about what is a traditional workspace. This way, you will better understand the value of a digital workspace. So, if you look at a traditional workspace today, immaterial of what industry or size of the company we are talking about…a traditional workspace has a location, an office, cubicles, devices not necessarily of that of your choice. You also don’t get all the facilities when you use them outside the office. For example, you will not be able to access some of the apps or information if you use a home PC or laptop. The company usually restricts the use of most of the apps. So, basically, there is a lot of limitation and restriction in today’s workspace like where you work and what you can access from. Also, it starts to get complex as you start moving to the cloud SaaS application. A lot of customers are accessing SalesForce, Concurrent etc. When I’m accessing SalesForce, I need to set up different logins and password. That results in a lot of frustration for the users when they don’t necessarily remember that and they can’t get access to information when they want it. So basically, there is a restriction and lots of limitation. The experience is not consistent when you go outside of office and change devices. This is what defines the nature of workspace currently. Now, when you look at the digital workspace, first of all, it is not a product. Its a notion of what the future of the workspace should be like. The digital workspace offers the users simplicity. This means that the users get to access the application and the information to get the job done should be very simple. Let’s take the password example. If I log in once, it should remember I’m a valid user of this company and give me access to all the applications without the need to authenticate multiple times. Second, it should be consistent. This means that if I’m at the office using an office provided computer, I get access to all the applications that I get and when I’m at home using my PC or travelling on the road and access my mobile, I should access the information and get a seamless consistent experience to do my job. And the third thing that a digital workspace offers is security. We have heard all these stories of these cyber attacks and if you looked at the root cause analysis, it shows that some of the machines are not patched with the right level of data security and there was a vulnerability. That’s a big problem in the traditional workspace. The digital workspace is secured with more modern technology without impacting the user experience. So, in summary, the digital workspace is these three things: Simple, Consistent and Secure. Kiruba: That’s fantastic. You encapsulated that beautifully. I’m curious though that with so many advantages, why do you think companies have still not embraced digital workspaces as much as they should have. Sanjay: I would say that there is a shift happening from the old culture of command and control to a more employee-led, employee-focused culture. In any new concept of technology, you will see that the new economy companies are the first ones to adapt to it. The old economy companies will drag their feet and do whatever they can to stay in the now but over a period of time, they are forced to change. What we have seen is that the companies that are the first ones to adopt digital workspaces are the ones with a big percentage of the millennial population. The work style and the preference of the millennials are very different and the digital workspace can help meet that expectation. They have been in universities and schools using gmails and access their emails from any computer, they have been using dropbox type of application where they can access their information anywhere. They are used to have the flexibility of accessing their information anytime and anywhere. Their work discipline is also very different. They don’t work 8 to 10 hours at a stretch. They work for a couple of hours, then go out with friends, then come back and catch up with work. So, if you look at that kind of work discipline, the traditional workspace will not meet their expectations. So, what we have seen is that new economy companies with a lot of millennial population are the first ones to make the shift. The second thing that we have seen is that companies in a B2C environment and in a competitive space are quick to adopt as they are forced to innovate to keep their market share and service their clients better. 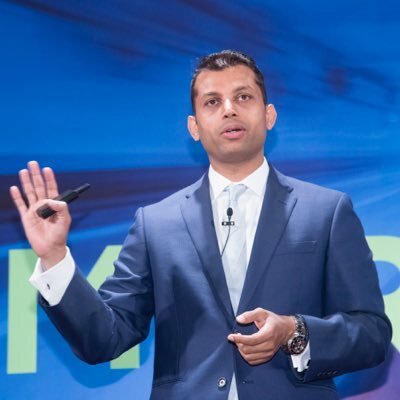 Kiruba: Now that you mentioned about adoption amongst companies with millennials, I’m curious to know how has digital workspaces affected their work-life and has it had any impact on their work productivity? Sanjay: We recently did a study with Forbes Insight. Our motive was to study if there was a connection between technology empowered and business success. We spoke to over 2000 customers around the World, a combination of both technology and business people across Industries and countries including India. We were happy to note that the report had a very strong correlation between successful companies leading in digital transformation and companies who are empowering their employees digitally with access to all the tools and information. The number one area where it impacts is the employee productivity and better work-life balance. Let me illustrate this with an example. State Bank of India is the largest bank in the country with over 20,000 branches across the country. The Chairperson of the Bank launched an initiative on the International Women’s Day to help the female employees have a better work-life balance. So, they had this challenge wherein the traditional work environment, the employees had to stay physically in the office from 9 to 5. During this time, they missed out on commitments at home, particularly for married women with kids and family to support. So, they launched this concept of work from home which means that employees could leave home early, attend to the family commitments and yet have access to their device and get access to work. So, we are of the strong belief that digital workspaces help in better employee work productivity. Kiruba: Agree that employee work-life balance is important. What is also important is for employees to get more revenues to the companies and to help cut costs. Can you elaborate on this, please? It depends on which business you are talking about. In terms of getting more revenues, let’s talk about a banking experience. In a traditional banking experience, the customers are the ones who go to the bank..the location is fixed and they have to meet certain people. In this environment, there are other progressive banks that are trying to capture the wallet-share of the clients. Typically, a customer will decide to give his or her business to a particular bank based on who is services them faster and efficiently. We have an example of a published case study of ANZ bank which is one of the largest banks in Australia. They invested in our digital workspace platform and they started the project with their customer relationship executives. They realized that after doing that their customer service executives were able to meet their client expectations. In one conversation, they were able to gather what the requirement is to even complete the transaction. In a traditional environment, they would have been like, “Let me talk to my team and get back to you” or “I don’t have access to the information because I don’t have my computer’ and things like that. But with the digital workspace, running on their iPads., they could meet their customers in the location of their choice and they could provide all the information that they need in terms of their portfolios, get information from their advisory teams etc. This is how a digital workspace can help the company increase their revenues which means you are empowering your customer-facing executives get access to all the information they need to service their clients better. This is how they can differentiate themselves and win the business against their competition. In terms of saving costs, we absolutely believe that there is no choice. If we go back 30 or 40 years in the manufacturing domain when the whole concept of quality and processes were introduced. There were questions raised that if we embrace such processes, it will increase our costs of production by 10% or 20%. People questions would they even do it? It’s like that. IF you don’t do quality, the customers will not buy your product. If companies need to be successful in this new age, where the employee demographic is changing and technology landscape is evolving at a rapid pace, they have to embrace the digital workspace. The current environment which the customers have is very siloed. They may have 20 different solutions to solve different problems. As a result of that, it increases the complexity and cost of infrastructure. By investing in a digital workspace platform, it simplifies all of that and it helps them save cost. You can also radically change your cost structure Just to quote one example here, in a traditional environment you would buy computers for your employee. You will spend Rs.60,000 or Rs.70000 based on what configuration of the computer you choose and you refresh the device every three years. What companies have failed to realise that users or employees don’t like that. If I’m a university graduate and I have always used Macbooks then that’s what I would like to use in my work environment. My daughter is 9 years old and she has her own iPad and she has multiple applications that she has to get her homework done. Imagine if she goes to her office and she is handed a black colour windows machine, she won’t be productive. One of the drastic ways to reduce the cost structure is to allow the employee to get their own device. Companies can sponsor part of the cost and by doing so they can reduce their outflow while the employees can get the machine of their choice. Kiruba: Most software is now offered in the cloud. Do you think the days are over for the boxed software? Do you think everything is going to go to the cloud? Sanjay: It depends on the company’s age and what business they are in. We do talk to a lot of customers and try to understand what kind of application infrastructure that they have. The reason why we do that is that at the core of what the digital workspace does is that it makes all the application available to the employee in a simple and unified platform. If you have been in the business for 20+ years and there are many businesses that have been around for that long, they will have a mix of Windows application, browser-based HTML5 applications, cloud SaaS applications, and a few mobile applications. At a very high level, these are the four different applications we have found with our clients. If you look at a new age company, somebody who has started two years ago, they would not have enough capex in the beginning and they would have started straight away with Salesforce on the cloud, SAP ERP on the cloud, Workday for HR on the cloud, They may have zero footprints of software in their computers. That’s the big extremes that you will witness in startups and in businesses that have been for long. For companies that have existed for long, it is not easy for them to shift from software they have been using to completely cloud-based applications. However, they are slowly making the transitions. Let’s say they have 50% of their applications are windows based and the remaining 50% is a mix of HTML5 and mobile applications. In 3 to 5 years time, this pie chart will change. The windows ratio will decrease but will never become zero. The biggest growth will be in mobile apps. This is because the companies have recognized that the users like this concept of the mobile moment. This means that if I’m here in a conversation with you and at the end of the conversation if I can approve an expense claim or approve a discount which is required to close a deal, that does a lot for my productivity and the response time for my business. Employees are used to this mobile moment concepts because that’s what they get as a consumer. After this meeting, you can fire up an Uber app or decide to get something delivered to your home so that before you go home, you have your wine or food ready. Employees are used to these mobile moments in the consumer world and they are expecting similar mobile moments in the enterprise world which they don’t get. That’s the reason we believe that companies will start investing in more and more mobile applications for those specific business processes that actually help the employees. Kiruba: Now that there are compelling propositions for companies adopting digital workspaces, how should companies go about to implement them? Sanjay: That’s a great question. We are engaged with our clients on an everyday basis to answer that question. Digital workspaces is the vision of the future that you need to go to. Our first step is to work with the client and introduce them to the notion of the digital workspace and get their buy-in into that notion. I have had the opportunity to have conversations with clients across the Asia Pacific and Japan and I have not found a single company that has challenged that vision. Nobody has said they don’t like digital workspaces, that employees won’t like it. Not a single client. Every company accepts the fact that that is the future. They want to empower their employees with simple, consistent experience to the applications, they should be able to access them from any location and any device and that they have to be secure. Then comes the question of how to go from the status quo to that of digital workspaces. The first step that we would advise our clients is to get a quick assessment of where they are. That would determine the path you need to take from where you are today to the digital workspace. Most of the times the clients make the mistake when they get excited about the vision of the future and the solution and jump on the bandwagon without knowing where they are today. So, doing a quick assessment of where they are today, what the application landscape is, what the cost structures are with regard to devices, what the policies are with regards to working from home or working remotely. We try to find the immediate problems that the client is finding right now. That becomes a great area to start with that you can achieve a quick success as you move in the direction of building a digital workspace. Then, we look at what the business priorities are because if you are trying to implement digital workspace which is not aligned to what the business goals are, it would not make sense. The State Bank of India example where the Chairman of the bank wanted to promote the concept of improving employee productivity and helping them maintain a work-life balance, that was a done with a business objective. The digital workspace platform enabled that. So, we try and understand the client if there are initiatives like that that are important to them. For example, we get a lot of feelers from the traditional banks that they are getting a lot of competition from FinTech companies, they are eating into the wallet share of our customers. They want to know how do they change the experience of their clients and get more market share. If that’s your number one priority then let us start with that area. Let’s look at how your customer service executives are engaging with your customers, mobilize that and enhance the experience. It is important to identify what the drivers of the business initiatives are and align the digital workspace initiatives with that of the business goals. So, in summary, I would recommend a three-step approach to get to the digital workspace. First, make sure that the foundation of the infrastructure is right. Many times client think that their digital workspace initiative is different from their cloud initiative or data centre initiative. The clients don’t realize that most of these technologies actually in the data centre and the cloud. So, it is important that both these initiatives are aligned. We work with the clients to make sure that they are moving from this siloed infrastructure to an elastic infrastructure which is aligned to their data centre and cloud strategy. That’s where the unique proposition of VMware comes in because we are the only company that works with our customers that offers them technologies from the cloud, mobile applications. The third step is about the users and applications. Set up an enterprise app store. Just like the way a user has a personal app store on their phone which they go to for all their applications, similarly set up a simple enterprise app store. Anything and everything the user has to do with regard to work, they go to these enterprise app stores, based on the device they are using, they use their Face ID, Finger scanner or retina scanner that authenticates them into the app store and they are free to access all the applications. The third step is the one that has the most impact on the user and productivity. The interesting thing about these three steps that lead to the digital workspace is that they are not sequential. It depends on your business priority. If you want to start with changing the experiences of your users today, we could start with the step 3. If you think that the infrastructure inefficiencies is your challenge, then we could start with solving those first. If you think you are struggling with security issues and managing the disparate and heterogeneous devices, we could start with unified endpoint management. So, these are the three steps approach that we advise a client to take if they want to successfully implement a digital workspace strategy. Kiruba: That was wonderfully explained. Thanks for taking the time out to explain to us the concept of digital workspaces.